In Torys’ Capital Markets 2012 Mid-Year Report, our article “CMHC Insurance and Covered Bonds—What Will Happen When the Training Wheels Come Off?”1 was written in response to actions taken by the federal government to significantly reduce its direct exposure to the Canadian residential mortgage market. During the financial crisis, Canadian banks and other mortgage lenders relied heavily on securitization programs sponsored by Canada Mortgage and Housing Corporation (CMHC) to provide liquidity during challenging times. In the two years since that article was published, the training wheels have not yet been removed, although the government has tested a number of tools it can use to remove them if and when it decides to do that. 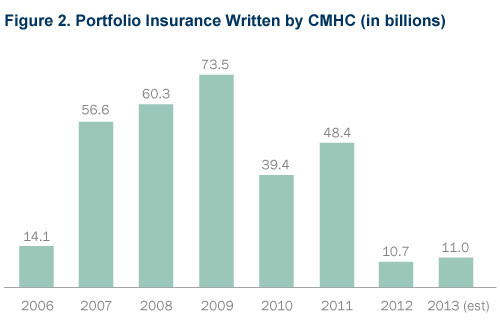 2012: prohibiting federally regulated financial institutions (FRFIs) from using insured mortgages as collateral for covered bonds and substantially reducing the amount of portfolio insurance that CMHC could write. 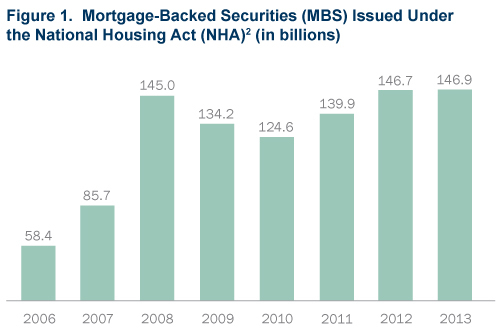 But as Figure 1. shows, these steps had little effect on the issuance of NHA MBS, with a significant amount of liquidity removed only this year. We believe that the federal government would like to reduce taxpayer exposure to the Canadian mortgage market and see private investors assume more of this risk. While there was a small market for uninsured residential-mortgage backed securities (RMBS) or asset-backed-commercial paper (ABCP) backed by uninsured mortgages prior to the financial crisis, it was too small to have a meaningful impact on the overall funding needs of the Canadian mortgage market. That small market disappeared in 2008, and only recently have bank-sponsored ABCP conduits renewed their acceptance of uninsured mortgages as collateral. Investors may be willing to invest in RMBS backed by high-quality conventional mortgages, but in today’s environment, these mortgages generally do not yield enough to stimulate private investment. Covered bonds are only available to large issuers because (i) they are primarily credit obligations of the issuer, so pricing is affected by the ratings of the issuer as much as, if not more than, the quality of the collateral, and (ii) they are expensive to implement in terms of fees that must be paid to CMHC in its capacity as Registrar of covered bonds in Canada, and legal and accounting fees. If OSFI could be persuaded to increase the limit on issuance of covered bonds to limits permitted in other countries (such as Australia, which permits up to 8% of assets), this could materially lessen the reliance of covered bond issuers on government-backed insurance. However, banks have been lobbying for an increase to this limit for many years and so far OSFI has not been persuaded. We believe that in order to permit the federal government to further reduce its exposure to the Canadian mortgage market, it would like to see a private RMBS market develop before it drastically reduces the ability of the Canadian mortgage market to rely on its NHA MBS guarantee. Increasing the limit on covered bonds would obviate the need for such a market, but in the absence of an increase in this limit, the withdrawal of so much liquidity in the mortgage market could have a material adverse impact on the Canadian housing market. We believe that a robust uninsured RMBS market in Canada can only evolve once several developments have occurred. The balance of this article discusses these needed developments. Many investors around the world suffered losses on investments in subprime RMBS. To re-engage in an RMBS market, we believe investors would need assurances on the quality of the underlying mortgages. In June 2012, OSFI released its final version of Guideline B-20, now currently implemented by all FRFIs. The thrust of Guideline B-20 is to establish prudent residential mortgage underwriting practices to manage risks in this market. If investors could be satisfied that the mortgages backing their private RMBS were compliant with Guideline B-20, their appetite for investment may grow. Investors may be willing to invest in RMBS backed by high-quality conventional mortgages, but in today’s environment, these mortgages generally do not yield enough to stimulate private investment. The challenge will be for the government to entice mortgage rates to rise (for example, by significantly increasing insurance premiums for insured mortgages or further restricting the availability of mortgage insurance) while at the same time not causing an alarming decrease in housing prices. We do not expect the government to take any exceptional measures in this regard before the next federal election. Investors in RMBS want to know that they will always be able to determine a mark-to market value, and that there will always be a bid for their RMBS before committing to the effort of analyzing uninsured RMBS as an investment. Much-needed liquidity for private RMBS could be provided if the Bank of Canada would agree to accept highly rated RMBS backed by Guideline-B-20-compliant mortgages as collateral for overdraft loans to Canadian banks.6 The Bank of Canada may have very good reasons for not expanding the list of acceptable collateral for overdraft loans at this time. However, if the Bank of Canada can see its way to provide the liquidity that the uninsured RMBS market will require, there may be more willingness to invest in these securities. Residential mortgages are amortizing assets; consequently, RMBS are typically structured as monthly pay pass-through certificates. The Canadian market has never been able to absorb large amounts of monthly pay pass-through ABS or MBS that are not government guaranteed. Because mortgage interest is not subject to Canadian withholding tax it might be possible to issue monthly pay pass-through MBS to foreign investors, but this may require currency hedging with additional costs. The demand by Canadian institutional investors for semi-annual pay bullet bonds is what led CMHC to establish Canada Housing Trust (CHT) and its Canada Mortgage Bonds (CMB) Program. The CMB issued by CHT are backed by monthly pay pass-through NHA MBS and are effectively packaged with swaps to support notes with bullet maturities that pay interest semi-annually like more traditional bonds. Given the resulting increased demand, the cost of funding using CMB is significantly less than the cost of funding on the underlying NHA MBS if such NHA MBS were to be issued in the market. VFCs were used in a few transactions prior to the financial crisis but were issued on an uncommitted basis; that is, in the event that the holder of the VFC elected not to allow itself to be drawn on to fund the repayment of another class of certificates backed by the same mortgage pool, the other classes of certificates would turn into monthly pay pass-through certificates. Investors have made it clear that they would not be willing to treat any certificate with a bullet maturity date as a true bullet maturity unless the VFC certificate constituted a committed facility. It would be very difficult for banks, or entities consolidated with banks, such as ABCP conduits, to provide committed VFC facilities because of the capital treatment they would carry. So far, no highly rated entity that is not subject to capital requirements (such as pension funds or government entities) has indicated any willingness to provide committed VFC facilities. Toronto-Dominion Bank sponsors a program through Genesis Trust II that issues semi-annual pay bullet notes backed by a revolving pool of home equity lines of credit. It would be possible to create a revolving pool of amortizing conventional mortgages, but it is not clear whether investors would accept the notes as having true bullet maturities if they could commence early amortization in the event that the seller were unable to continue to sell new mortgages into the structure. Although there are strong signs that the federal government would like to accelerate the removal of its support for and exposure to the Canadian mortgage market, there are still several important obstacles to overcome before private investors will be willing to take on this exposure in a meaningful way. Unless the government is willing to risk destabilizing the Canadian housing market, we are likely to continue to see government support of the Canadian residential mortgage market at levels far in excess of pre-2008 levels for several more years. 5 Letter from Office of the Superintendent of Financial Institutions Canada to All Deposit Taking Institutions (June 27, 2007) regarding Limited Issuance of “Covered Bonds” by Canadian Institutions, online: Office of the Superintendent of Financial Institutions Canada. 6 Through its Standing Liquidity Facility, the Bank of Canada provides overdraft loans to certain financial institutions on a secured basis. The list of acceptable collateral was expanded during the financial crisis to include ABCP that met specified criteria but it has not been expanded to include any other types of asset-backed securities or mortgage-backed securities, other than NHA MBS or securities backed by NHA MBS. See www.bankofcanada.ca/wp-content/uploads/2014/03/SLF-Policy.pdf. 7 Maturity dates in this sense refers only to expected maturity dates: failure to pay on maturity would lead to accelerated amortization, not default.